Prostate cancer early detection testing using the PSA test is one of the most controversial subjects in medicine today. This on-going controversy is not good for men who depend on their doctors to provide clear guidance for their prostate health. As a prostate cancer survivor and patient advocate I sometimes sense a lack of urgency to seek solutions to this controversy which is leaving patients confused and at times frantic about what to do. Make no mistake, these patients’ decisions will translate into life or death calls for some, and they deserve clear guidance. I believe that leaders within the prostate cancer medical profession must work towards ending the PSA test controversy by embracing what is known and accepted while continuing to seek answers for the unknown. During the past two years we have witnessed the widespread acceptance of the concept of prostate cancer overtreatment and active surveillance, along with guidance to discontinue PSA testing for older men with a limited life expectancy. In my view this represents progress towards ending the controversy. Another area of widespread acceptance is that African American and men with a family history of prostate cancer are at high risk for being diagnosed with the disease, and that African American men die at a rate 2.5 times greater than other men with prostate cancer. It is also well known and accepted by expert researchers in the field that these high risk men were not included in significant numbers within the randomized clinical trials that are the genesis for the ongoing controversy. It is well accepted that these high risk men have a great need for clear guidance on early detection testing. PHEN has taken steps to address this need. 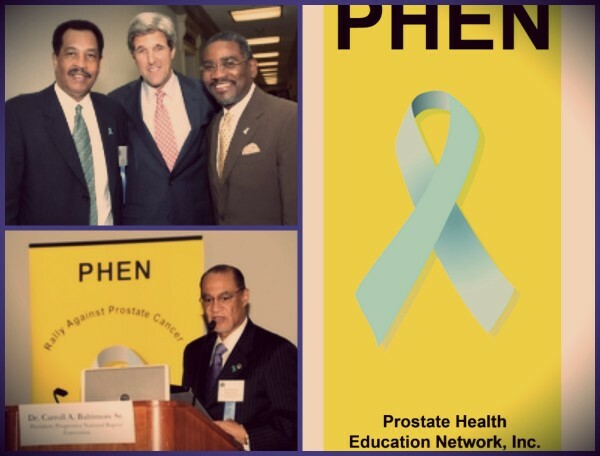 PHEN’s “Consensus Statement on PSA Testing for African American Men for the Early Detection of Prostate Cancer” was presented at its “Annual African American Prostate Cancer Disparity Summit” on September 18th, 2013. This consensus statement is based on the “expert opinion” of the twenty three (23) prostate cancer medical experts who are signatories on it. Using this consensus statement PHEN has now published “Guidance on Early Detection Testing for Prostate Cancer for High-Risk Men” that can be clearly understood by laymen. PHEN’s Consensus Statement and Guidance targets African American and other high-risk men. However, PHEN was not the first organization to recognize the need, and take steps, to separate prostate cancer early detection guidance for average-risk and high-risk men. It is important to note that both the AUA and PHEN saw the need to separate their early detection guidance for the exact same reason; a lack of scientific evidence from the PSA screening trials for African American and other high-risk men. The AUA however, stopped short of providing any direct guidance for high-risk men. PHEN, on the other hand relied upon expert opinion to formulate its guidance; the only option available in the absence of scientific evidence. It is only responsible and humane to provide clear and direct guidance to the men most likely to be diagnosed with and die from prostate cancer. A failure to do so I consider gross negligence. Widespread adoption of separate guidance for high-risk and average-risk men for prostate cancer early detection testing is clearly needed. In addition, this step will help end the ongoing controversy that currently engulfs us all. Towards these objectives I call upon the AUA, National Comprehensive Cancer Network, U. S. Preventive Services Task Force, American Cancer Society, State Cancer Control Commissions, and Prostate Cancer Patient Education and Advocacy Organizations to embrace PHEN’s Consensus Statement for the Early Detection of Prostate Cancer for African American and other High Risk Men. This year PHEN is celebrating its Ten Year Anniversary! We have been on an exciting and productive journey during our first decade while paving a road for the future. 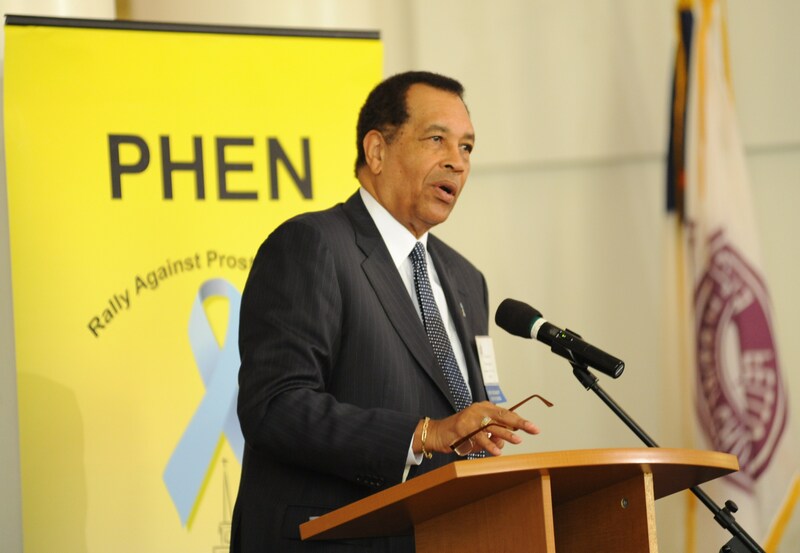 I was diagnosed with prostate cancer in 2000 and founded PHEN in 2003 to increase awareness and knowledge about prostate cancer within Black America which suffers an alarming 140% higher death rate than for all other men. There is a widespread void of knowledge and actions needed to address this deadly crisis. PHEN’S first ten years has been dedicated to mobilizing a series of national initiatives aimed at filling this void. These initiatives are achieving impressive results and PHEN is now widely recognized as a leader in prostate cancer patient education and advocacy efforts. We celebrate PHEN’s accomplishments with a great sense of progress and excitement, and with a strong foundation of enduring and proven initiatives on which to enhance and expand our efforts for the work that still lies ahead. I invite you to celebrate with us by joining our rally and continuing your support of PHEN to help shape a future for all men absent prostate cancer. deaths from certain types of cancers and be defined as cures? The answers to these and similar questions are important in shaping the public’s understanding about cures for cancer. However, based on what I understand about ongoing research efforts there will probably be multiple forms of cancer cures that will differ based on the type of cancer, the patient and the definition(s) of cure. What is the definition for a cure for prostate cancer, and do we have a cure entering 2012? If an accepted definition for a prostate cancer cure is survival after a diagnosis with minimal to no impact on a man’s quality of life then there are cures for the disease as we enter 2012. These cures may at times involve multiple combinations of treatments and therapies and differ from man to man. I consider my personal eleven year prostate cancer survival to be within this definition of cure. Conversely, I believe that the vast majority of prostate cancer deaths and sufferings today are due to a lack of information and knowledge about accessing the cures available in a timely manner. Information and knowledge about one’s risk level, early detection, treatment options, and managing survivorship issues are critically important to a cure for prostate cancer in 2012. For a man not to have this knowledge is to play Russian roulette with his prostate. The journey for reaching a prostate cancer cure where there is no magic bullet available can be complex, but certainly navigable. As we enter 2012 PHEN continues to broaden its educational outreach to assist men and their families along this journey. We will augment our monthly live webcasts which began in January, 2011 with a monthly e-newsletter highlighting information about available treatments and clinical trials. Many of our sponsors and partners are at the forefront in providing new and innovative treatments, therapies and detection tools that will be part of the focus of our educational outreach efforts. Knowledge is the best defense against prostate cancer in 2012. PHEN and its partners are committed to reducing prostate cancer deaths and suffering by increasing the overall knowledge base about the disease and the approaches to cures and survivorship. Our information is aimed at men and their families as we emphasize the importance of wives, mothers, sisters and daughters becoming actively involved in the prostate health of the men in their lives. Prostate cancer is a disease that impacts the entire family and in many (perhaps most) cases family members are needed to support a man’s efforts to become knowledgeable and interface with his doctors. PHEN invites you to use our online resources available to you at your convenience, tune in to our monthly webcasts, and study the information presented in our e-newsletters to increase your knowledge. Join our efforts to help cure prostate cancer cases in 2012 with the health of your family as a primary goal.